This sales price in Little Holmby may surprise some as it sold higher than its previous sale just last year. 811 Warner Ave., LA CA 90024 lasted 19 days on the market before receiving an accepted offer. 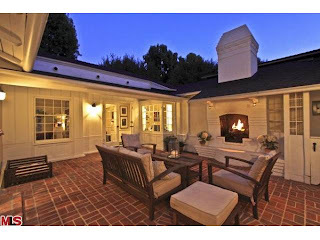 The home was listed on 10/4/09 for $1,750,000 and it closed on 12/14/09 with a final sales price of $1,725,000. The home was previously purchased on 10/09/08 for $1,610,800. According to the MLS, it is 3 bedrooms / 1.75 baths, 2,011 sq ft of living space on a 5,619 sq ft lot. The yard is mostly in the front of the house and the center courtyard that the house surrounds. As seen in the picture to the left, the courtyard is made up of brick patio and has a fireplace. The home has been nicely remodeled throughout with dark hardwood floors, crown molding and wainscoting, newer kitchen (stone tile counters, newer cabinetry, stainless steel appliances) and baths with carrera marble.The home is located a few blocks away from the award winning Warner Elementary School.